East College was Amherst's third dormitory, built in 1857-58 and designed by Charles E. Parkes of Boston (King, 312-13). It had 48 rooms, and was hoped by the upperclassmen that it would become, as the school newspaper described it, "the 'habitat' of the Senior Classes, where they may preserve a lordly seclusion, apart from the 'multitudine obscure et humile' " (King, 60). 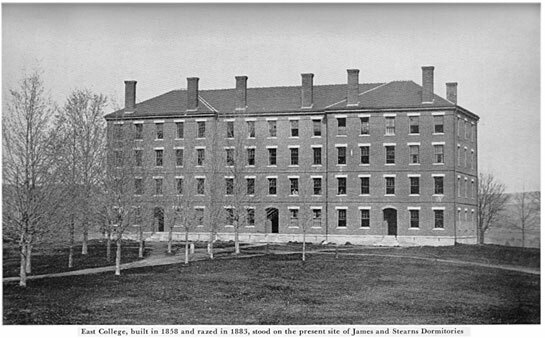 As more fraternities bought houses in town that provided accomodation for many students, the trustees decided to have East College razed	after the construction of the College Church nearby, in 1883 (King, 4-5). It is pictured below from "The Consecrated Eminence" (52).